It's that most wonderful time of year again. 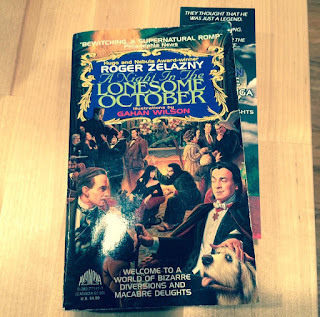 While I do try to fit in a lot of horror movies in October, one of my favorite things to do is an annual reading of Roger Zelazny's A Night in the Lonesome October. The novel is about a strange game being played by some familiar faces from the world of the macabre and each chapter takes place over the course of a day in the month, culminating with a fantastic finish on Halloween. My brother turned me on to the book years ago and it has been a staple of my monthly activities ever since. If you haven't read it before, I heartily recommend checking it out.